Shares of Transocean, Oceaneering International, and National Oilwell Varco are still trading well below pre-crash levels and look cheap today. Investors trolling the market for bargain-basement stocks have inevitably stumbled across the energy sector lately. While the broader market is still trading at a frothy valuation and around all-time highs, most energy stocks are still reeling from the price collapse from 2014-2016. For investors willing to put the time in to understand the industry, it is a superb time to find great companies selling at decent valuations. Three businesses that are still trading at steep discounts to their pre-crash levels are Transocean (NYSE:RIG), Oceaneering International (NYSE:OII), and National Oilwell Varco (NYSE:NOV). Let's look at why these stocks are still in a slump, what it will take for them to rebound, and why they may be a bargain to buy now. Why have these energy stocks been hit particularly hard? There is one thing that these three companies have in common: They either have all or a considerable portion of their success tied to offshore drilling. Transocean owns rigs used in offshore drilling and exploration, and Oceaneering International sells subsea equipment and leases out remotely operated submersibles for various services. National Oilwell Varco is an original equipment manufacturer that covers both on and offshore, but equipment for offshore rigs remains its largest business segment. When oil prices started to crash, one of the first things oil and gas producers cut was exploration budgets. As companies completed their respective contracts with rig companies, they elected not to take on new work. This meant offshore rigs and support services such as remotely operated submersibles found themselves without work. Both Transocean and Oceaneering International have been able to weather the storm to some degree because they had some equipment under long-term service contracts that are still in effect. All of these actions have led to the stock prices for Transocean, Oceaneering International, and National Oilwell Varco to drop precipitously. Over the past three years, their share prices have been cut in half or more. Why haven't these stocks rebounded with oil prices up to $50 a barrel? There is one element that makes this recent oil cycle different: shale drilling. Five years ago, shale drilling was mostly reserved for natural gas and was still an expensive endeavor. Producers drilling for shale oil have a sharp learning curve, though. Companies have continued to experiment with ways to improve well economics. So much so that some shale oil producers today get better rates of return at $50 a barrel than they did at $90 back in 2012. There is another quality that makes shale drilling so different than the traditional oil market: time. Oil producers knew about the existence of these shale reservoirs for years -- most are located above or below conventional oil and gas reservoirs. That means little exploration work went into finding these reservoirs. Also, thanks to all that technological development in the shale patch, it only takes a matter of days for a prospective field to become a producing well. Compare that to the multiyear development plans for most offshore projects. For cash-strapped producers, shale drilling is a more attractive option right now. Money invested in a shale well today will start to throw off cash in a matter of weeks and help replenish previously drained cash coffers. Offshore, however, is a go-big-or-go-home kind of venture. The payoff for an offshore field can be huge, but it takes years and billions to develop. Faced with the choice of dedicating capital expenditures toward shale or offshore, producers have almost overwhelmingly chosen to develop shale. Are these companies still worth an investment, then? It's a fair question to ask whether the cost effectiveness of shale drilling makes these companies relevant anymore. Since shale drilling is so cheap and efficient, why would any management team even bother to go offshore anymore? As effective as shale has been at filling this recent void in the market, there are many other factors at play here. The natural reservoir decline for non-OPEC countries today is 5%, which means we need to add about 2.8 million barrels of oil per day (mmbpd) to the global supply just to keep production steady. That's before the 1.4 mmbpd to 1.6 mmbpd of additional supply needed to meet growing demand. Shale can fill a big void in the market for a while, but an additional 4.2 mmbpd annually will need to come from a more diverse set of sources. That is where Transocean, Oceaneering International, and National Oilwell Varco come back into the conversation. Eventually, we will hit a point where shale won't be able to take up all the slack in the global oil market. From there, oil prices will likely rise, and producers will head back into the offshore environment again. Transocean will be the first to benefit from this trend as its rigs are mostly used for exploration. Its fleet of rigs -- which has undergone a substantial change since the oil decline started -- is now one of the newer and most technologically capable on the water. It also helps that Transocean was able to reduce its debt leverage with its backlog of contract work. Today, the company seems well positioned to see the effects of a modest rise in oil prices that sends production companies to the seas again. 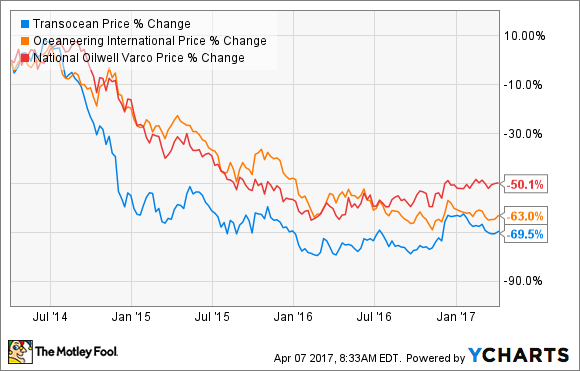 Oceaneering and National Oilwell Varco will likely see a more delayed rebound than Transocean. Oceaneering's fleet of remote submersibles is mostly used for the development and construction phase of an offshore project, whereas National Oilwell Varco will have to wait until demand for large-ticket items such as floating production, storage, and offloading (FPSOs) and new rigs are in demand again. That said, the two have dominant market share in their respective industries and the balance sheet strength to stay the course and be ready when the time comes. Judging these stocks on a valuation basis is tough right now. Cyclical stocks are hard to value using such metrics as price-to-earnings ratios because valuation very much depends on where that stock is in the industry cycle. One that is a little more consistent, though, is price to tangible book value since it's a valuation of the underlying assets that generate earnings rather than the earnings themselves. 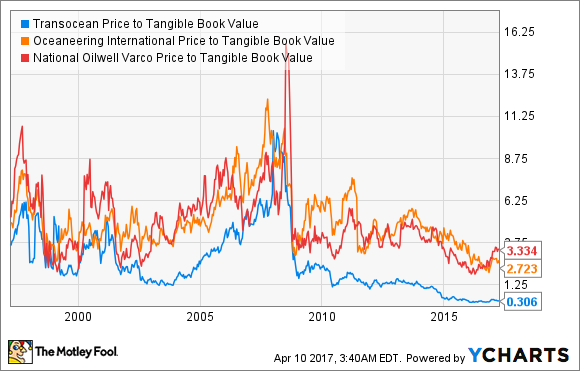 In this case, all three are trading well below their 20-year historical average valuation, with Transocean selling at a dirt-cheap 31 cents on the dollar of tangible book. Buying energy stocks in anticipation of a rebound means that you have to know how those stocks will respond during the rebound. Someone who bought these stocks without knowing this would inevitably have been frustrated when shale producers and onshore-centric oil services companies started to bounce back. For those willing to wait longer for a payback, shares of Transocean, Oceaneering International, and National Oilwell Varco do look rather cheap today.